BULLET-PROOF are a Slovak/Italian Thrash Metal band comprised of Richard Hupka (guitars and vocals), Max Pinkle (guitars), Federico Fontanari (bass) and Lukas Hupka (drums). The quartet has released its sophomore album in April 2017. The album, named “Forsaken One”, is filled with thrashing riffs, theatrical sound effects and aggressive vocal passages, producing a record that is gritty yet melodic. A critique of colonialism, the first track “Might Makes Right” opens with the quote “Justice is nothing else than the interest of the stronger” by Plato before transitioning into a high-impact aural assault. Thunderous drums and guitar riffs are aplenty in this piece. Theatrical effects are abound in the title track “Forsaken One”, where the addition of distant marching sounds and thumping heartbeats helps create a suspenseful atmosphere. The staccato vocal passages here serve as an interesting touch to this track. A series of steady drum beats welcomes the third track of the album “Portrait of the Faceless King”. The chorus is exceptionally melodic, with repetitions of the phrase “faceless king” thrown in. “No One Ever” showcases dynamic chord progressions, and Richard employs his harsh and raspy singing here. Halfway through the track, a soft guitar solo set against a mellow backdrop is introduced to listeners. Soon after that, the whole song picks up its pace and speeds into a rapid succession of guitar solos and bass lines. “Revolution” kicks off with an intro filled with sirens and then segues into strings of pulsating blast beats while Richard assails listeners with his harsh singing. Finally, “Little Boy” is introduced with warm and melodic guitar that quickly transitions into a series of pummeling drum beats. Unfortunately, the chorus in this track sounds very awkward, as it seems to be in constant conflict with the riffs in the background; also, there are too many words within one line of the chorus, ruining what could have been a superb closing track. 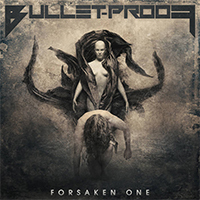 Despite some of its minor flaws, “Forsaken One” by BULLET-PROOF is a really worthwhile listen and definitely showcases the strengths of the band. The band’s usage of audio effects gives the album a theatrical flavor, and the band members are really skilled musicians too.